Tired of filtering through all of your daily coupon emails to find and purchase great restaurant discounts? Tired of opening and closing apps and searching your inbox to find previous purchases? You may want to streamline your restaurant discount purchases with the BiteHunter iPhone app. You can search through deals offered by Groupon, Gilt City, Deal Chicken, and other providers in your area, as well as purchase and redeem them within the BiteHunter iPhone app. The BiteHunter iPhone app has a strong visual interface with customized search features to simplify the process of saving money at great restaurants. The excellent tutorial contains a succinct, clear introduction to its tools, features, and icons. You activate location services, and your screen fills with restaurant deals. There is a menu bar with three tools for navigation–a settings icon, a dial to sort by cuisine, and an icon to determine how the deals are presented. You can sort by a photo grid with thumbnail images of the restaurant and a banner with a brief description of the grid. You can scroll through the deals with responsive gesture controls. You can select to view the deals in a list form with restaurant name, discount details, and rating. Or, you can view details in a map. You can pinch the screen to change the area viewed. Restaurant details are marked with a location flag. You can also scroll through the dial using horizontal gesture controls to search for deals by cuisine. Navigation is easy, and the load time for the deals is quick. For each specific deal, you can access as much information–or as little as you want–about each restaurant with a touch. If you want to check out the menu, you can touch the screen and it appears. If you want to check out Yelp reviews, you touch the screen. Unlike many other restaurant iOS apps, the BiteHunter iPhone app provides access to details without cluttering your screen. The best features of the BiteHunter iPhone app are accessed when you set up an account and link your existing discount accounts. The account settings are accessed by touching the settings icon. You can create an account with BiteHunter and securely store your credit card information to purchase from within the app. You can also link your existing accounts to the BiteHunter iPhone app, so you can purchase and redeem your deals through your BiteHunter iPhone app interface. You are not transported from BiteHunter to another iPhone app or Safari URL link to purchase and redeem deals. You definitely don’t have to recall which deal you purchased from which provider, open and close iOS apps, and search through your email to find them. A number notification in the upper right hand corner of your BiteHunter icon on your iPhone lets you know how many deals you have that are ready for redemption. The BiteHunter iPhone app currently supports Bloomspot, DealChicken, Dealfind, Double Take Deals, Gilt City, HomeRun, JB Dollar, Saveology, Signpost, Travelzoo offers, and Valpak Deals. 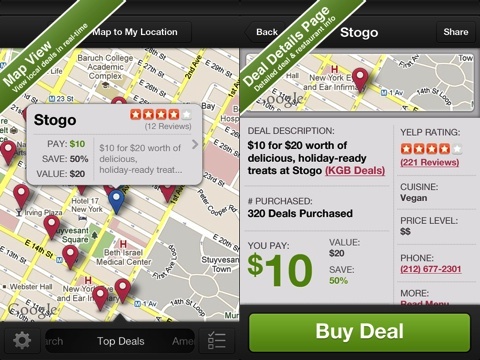 The BiteHunter iPhone app also allows you to purchase deals from internet sources like Restaurant.com, Living Social, Yelp.com, and Facebook without leaving the BiteHunter iPhone app interface. The BiteHunter iPhone app is also a great resource for traveling and road warriors. You can adjust the location to a different city. You touch the settings icon, tap location, and type the city’s name. If you are planning a vacation or you frequently travel for work, you can search, purchase, and redeem for different locations. When you travel, you’ll definitely have your iPhone with you to quickly redeem a voucher. 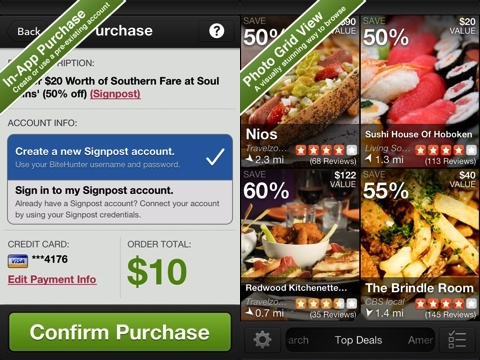 The BiteHunter iPhone app brings order to your restaurant coupon clipping chaos with intuitive navigation and seamless integration with your existing restaurant discount accounts. AppSafari review of BiteHunter – Dining Deals for Restaurants was written by Joe Seifi on July 13th, 2012 and categorized under App Store, Food, Travel. Page viewed 4743 times, 3 so far today. Need help on using these apps? Please read the Help Page.